WE Architecture, in collaboration with REKA Gruppen A / S and KAB, is constructing a new area with 70 housing units on Kajerødgrunden in Birkerød. The prerequisite for the project has been to draft a proposal for the future brick villa interpreted into a low-dense residential area with mixed housing typologies. WE Architecture is pleased to be selected as the designers of a multifunctional space by Seel Bobsin Partner. The concept is exhibited in the roadshow "YOUNG YOUNGER FOREVER YOUNG - SHAPING SPACES BY THE NEW GENERATION" with an accompanying book publication. WE are looking for new interns for the spring semester. Be a part of a young, dynamic office in growth, creating original architecture focusing on quality. WE are so proud to announce that we have won the competition to design the new nursing home in Esbjerg “Krebsehusene” as well as developing the site plan for the futures elderly friendly neighbourhood together with GPP, Rambøll and SLA. WE Architecture is prequalified, together with GivRum, Schønherr and Lars Nicolai Bock from the Århus School of Architecture, in the competition to transform the old industrial buildings of Willemoesgade in Århus, Trøjborg. 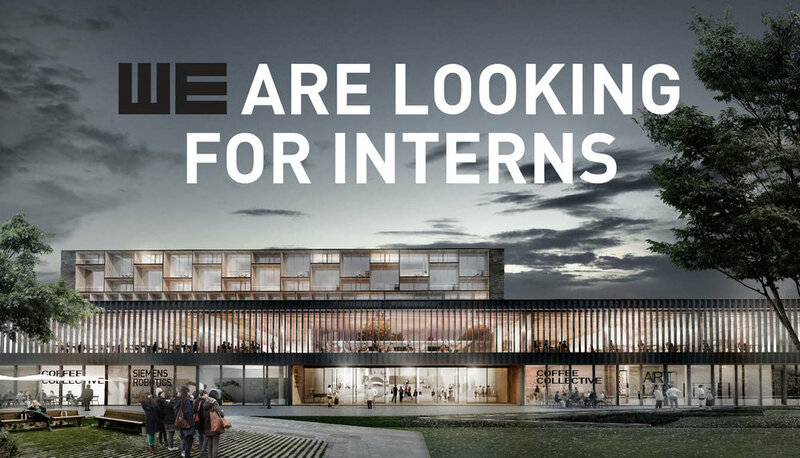 WE are looking for danish speaking, experienced design or constructing architects. Be a part of a young, dynamic office in growth and create original architecture focusing on quality. The exhibition “Art of Many - The Right to Space” can be seen from February 9th till May 28th at the Utzon Center in Ålborg. WE architecture is exhibiting at NØRÐÍC- A Kaleidoscope of Scandinavian Architecture. This friday WE architecture was exited to participate in the groundbreaking of Roskilde Campus. The new Campus will gather several educations of erhvervs akademiet Sjælland in one building, that will become an incubator and a flagship for new ways of learning.